Once vegetable seedlings are established you’ll need to do three things for success: keep them weed-free, keep them well watered and make sure they have enough nutrients to grow on strongly. An organic mulch will help you to do all of the above, while showing off your crops to their full advantage. Why Use an Organic Mulch? Weed suppression. Mulches block light from reaching the soil, dramatically reducing weed growth and saving you lots of time and effort. Protecting the soil. Harsh weather conditions can result in compacted and eroded soil, but mulch protects the soil surface against this. Moisture retention. Adding a mulch onto moist soil helps keep soil moisture locked in for longer. Improving soil. Organic mulches help to feed the soil as they rot down. They improve conditions for earthworms, which will in turn improve your soil’s structure and, therefore, plant growth. Biodiversity and natural pest control. Mulches also attract many beneficial garden predators such as spiders and ground beetles, which help to keep insect pests under control. Mulching is a great way to use up garden trimmings. For instance, you can apply thin layers of grass clippings as they become available (though not if the lawn has been treated with weedkiller), or you can shred woody prunings then spread them around trees, shrubs and fruit bushes. Shredded prunings or shredded bark are also perfect for mulching paths between beds. Straw or hay is a good choice for robust or upright crops. Lay it nice and thick because it will settle. Straw will help to keep fruits such as strawberries, zucchinis, and bush tomatoes clean and dry. Lift the foliage off the ground then feed it in underneath to protect developing fruits from rotting. Avoid laying mulches in cooler, damp periods of spring when they may act as a haven for slugs. Before laying a mulch, first remove any perennial weeds. In dry weather give the ground a really thorough watering, or wait until it has rained before laying the mulch. Lay most mulches a minimum of one to two inches, or 3-5cm deep. Some, like straw, can be laid much thicker than this. The one exception to this rule is grass clippings, which should be applied in thin layers regularly to avoid it turning into a smelly, slimy mat. 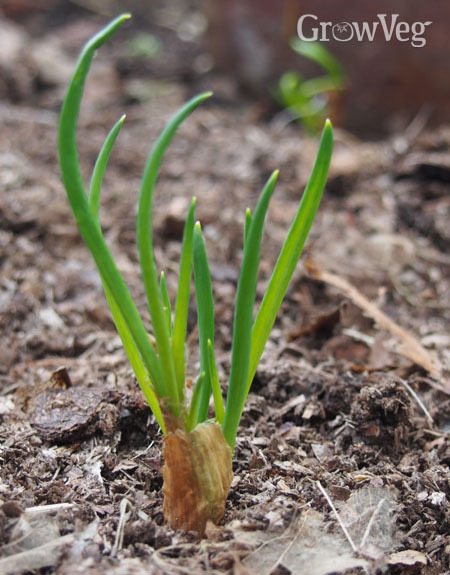 Soil that’s currently bare can be mulched to protect it from harsh weather and to stop weeds from spreading. Layers of thick, brown cardboard, laid so that the sheets overlap by at least a foot (30cm) will thwart most weeds by excluding light. Weigh the cardboard down with bricks or stones to stop it blowing away. This is a good way to keep soil in healthy condition over winter. Lay the cardboard down in autumn/fall or early winter, having first spread out a layer of organic matter such as compost or well-rotted manure to improve the soil. Planting through a mulch is easy. Carefully draw it back, then dig a hole for your plant and water it. Push back the mulch, taking care not to smother the young plant. Paper mulches suppress weeds and will also help to conserve soil moisture. To plant, simply cut a cross shape in the paper, dig a hole and plant through the paper. Water through the slot. Mulches make the gardener’s life so much easier; use them throughout your plot and they’ll save you a lot of work!